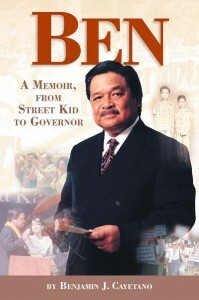 From a hardscrabble childhood in the rough Honolulu neighborhood of Kalihi to his two terms in the governor’s mansion, Washington Place, Ben Cayetano’s story offers a riveting look at Hawaii yesterday and today: ethnic voting, Hawaiian sovereignty, Bishop Estate, the drama of 9-11 and the back-room maneuverings of politicians and business leaders. Here is a rare glimpse behind the scenes, an unflinching memoir with no punches pulled, told with warmth and candor in his own words. Benjamin J. Cayetano served as governor of Hawaii from 1994 to 2002 and was the first Filipino American elected as a United States governor. He currently lives in Honolulu with his wife, Vicky.